Follow my blog with Bloglovin L'Oreal Colorista through BzzAgent! 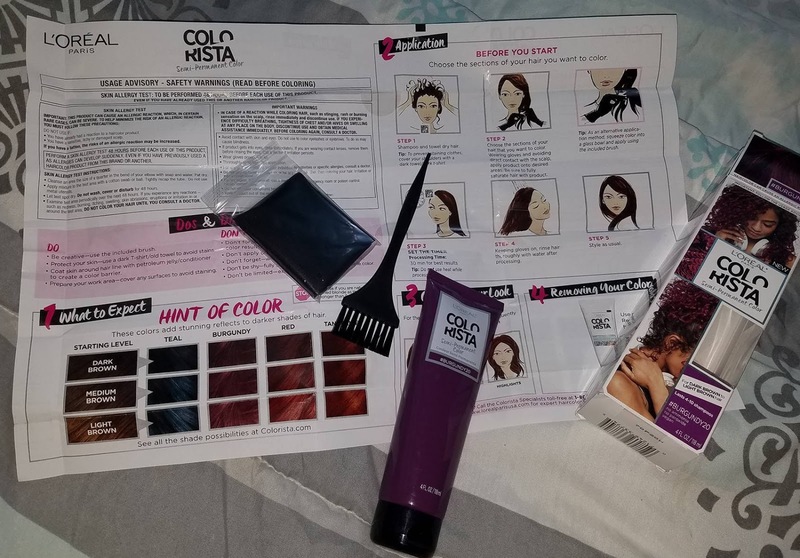 I received a full sized L'Oreal Colorista in Burgundy from BzzAgent for FREE in order to give my honest opinion and review the product itself. To find out how you can get yourself some free products from BzzAgent Click here! I am not affiliated with Mr.Clean products and purchased those myself. I have had my hair every color under the sun. I have had my hair teal, purple, black, bleach blond, red, bright blue and, natural. 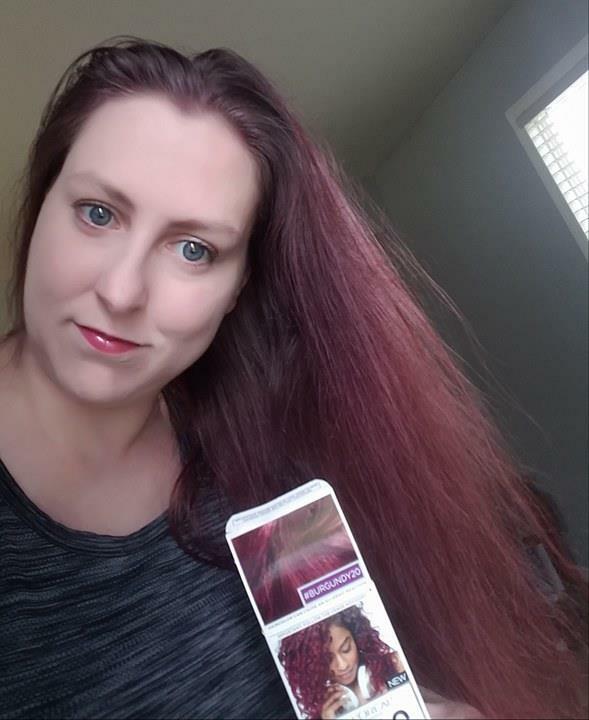 My natural color which, I had before this product trial was a medium brown with natural red undertones. 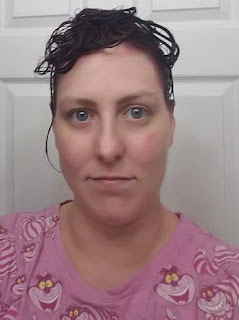 The last time I had seen my natural color was when I was 12 (I will let you guys guess how long ago that was) so I was a little hesitant to try even a temporary hair dye. Needless to say I am very experienced with all sorts of hair dyes though, I am not a professional. Yes it looks ombre but, this is natural for me throughout the seasons. Enough dye for whatever you plan on doing. 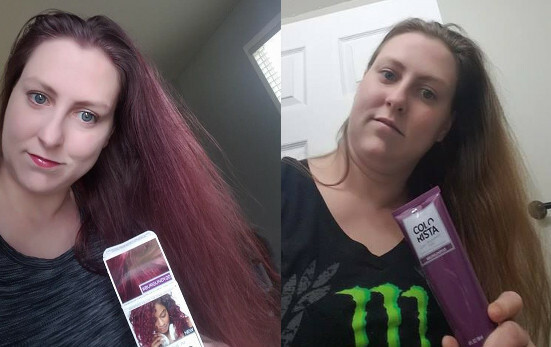 For thicker hair as long as mine (mid-back) you will need 2 or 3 of the colorista. With my super thin fine hair I needed just one for my whole head. Knowledge! If this is your first time using L'Oreal Colorista or similar dyes arm yourself with a good dose of you-tube knowledge. I like Crystal Lindy's video of the ones I watched. https://youtu.be/Ymr_h0Ll3tg There are several different video's out there watch a few to get a good grasp of how to do it. Also have your patch test done 24 hours in advance of using this or any hair dyes (See the instructions for more detail). This is what comes in the box of L'Oreal Colorista! I really love that nearly everything I need is included in the box for Colorista. Most any other brand you buy you will have to purchase a tint brush and gloves separately which really can add to the cost and upkeep of your hair. The only things I really needed were my lucky hair dye shirt, a few towels and, a bowl. Yes, I have a lucky hair dye shirt. I have had it for about 4 years now and somehow, manged to never make a mess on it. L'Oreal Colorista is now one of my favorite brands for bright colored hair. The product is like a lot of other funky colored dyes except it does not recommend that you bleach (damage) your hair before you use it. 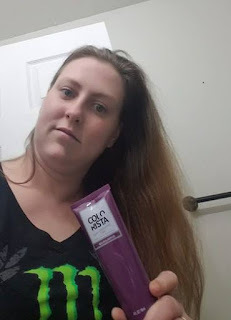 Colorista is also unique in the fact that it says you should NOT use heat after you put the product in your hair. A lot of other brands will tell you to use heat to get deeper color results. Colorista gave me excellent results after the recommended 30 minute leave in time which can also be considered unique. With most other brands (maybe other colors as well) you will find that you have to do it twice or leave it on a lot longer than the instructed time. The only thing I did not follow 100% to the instructions was the washing your hair right before use. I have always washed my hair the night before and dyed the next morning. I do this because of my fine thin hair a lot of dyes do not like to go into it if it is freshly shampooed. You however do not want to put or have any product residue in your hair before dying it. It will ruin the color. Yup got a little on my cheek but, it came off easy enough. I really like the results I received from L'Oreal Colorista. I would strongly recommend it to anyone looking for a new bright and colorful hair look. I will more than likely purchase it and use it again. That teal for dark hair looks amazing! Leave a comment below. Have you tried L'Oreal Colorista? What did you think? Red or light brown for me?